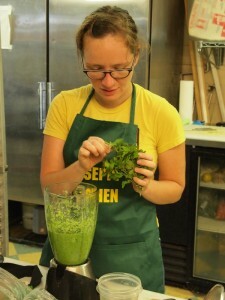 Making Aji Verde in our spiffy aprons! As Austin has emerged as a leading foodie city in the United States many opportunities have arisen to sample the local fare, but none of these festivals or events unites the community like the Austin Hot Sauce Festival. The Hot Sauce Festival, which has been sponsored by the Austin Chronicle for the last 22 years, cuts across all demographics to attract commercial and home cooks across the city and the state to compete for a coveted “best hot sauce” or honorable mention. Being Texas, the hot sauce festival is extremely popular with festival goers and hot sauce makers alike. This year, James and I joined in the fun. The Hot Sauce Festival competition is exceptionally inclusive – anyone who wants to enter a hot sauce and has $20, can. In addition to participating in the event, you have the honor of having your food tasted by a panel of judges including food writers, chefs, and three times James Beard award winner and hot sauce aficionado Robb Walsh. Finally, and most democratically of all, if you want the public to sample your sauce at the festival all you have to do is prepare it in a commercial kitchen. Just Add Chef was offering free kitchen time to non-commercial contestants which was a fantastic chance to use some industrial strength equipment that we just could not pass up. For the festival we decided to make two very typical Peruvian Ajis using locally available peppers from Johnson’s Backyard Garden. Ajis are pepper sauces that are used as table condiments in Peru and Ecuador. Every restaurant and home chef will have their own recipes and techniques that can vary dramatically, but usually there is a lot of flavor and a good amount of heat. 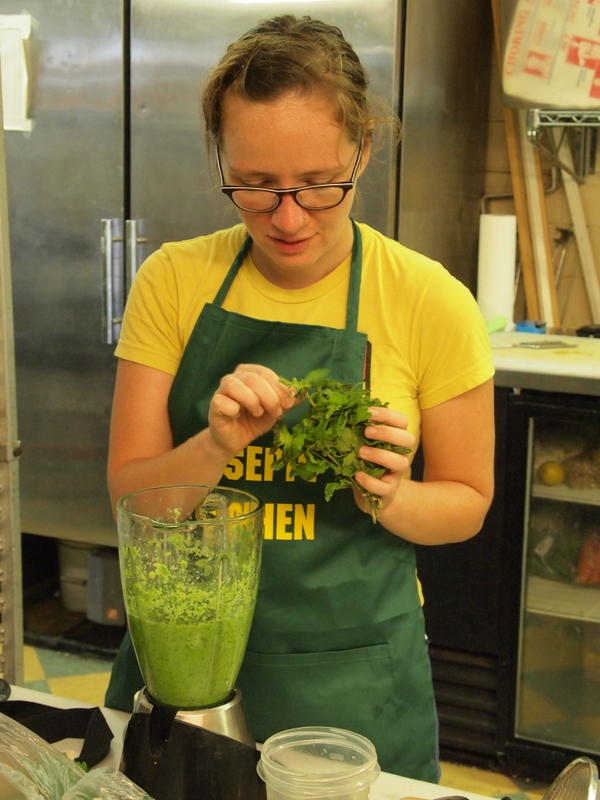 Aji Verde is a green sauce made with an abundance of herbs including a Peruvian mint, huacatay. Our second aji was a version of Aji Amarillo which is the cornerstone of all Peruvian cuisine that appears on most restaurant tables in the country and adds flavor and color to the country’s most famous dishes. On Sunday morning we arrived at the festival early to register our Ajis and came back a little later in the afternoon to get in on the samples. The festival is so popular that the organizers had set up a dozen different hour long lines to try the sauces submitted by companies and individuals. James and I took turns holding our place in line while the other ran around the festival getting samples from the sponsor tents and procuring adult refreshments. When we finally reached the sample tables we were rewarded with a wide variety of hot sauces including smooth and savory barbecue sauces, hot and sweet chutney style sauces, and lots of spicy, smokey, peppery varieties. We both agreed that out of the samples we had James and I enjoyed a hot Asian style garlic sauce. To whoever made that – I want to buy a jar! Sad to say, James and I did not reign victorious in the competition, but we were really pleased with our submissions and hope that the judges and festival attendants enjoyed them as well. You can view our Aji Amarillo and Aji Verde recipes on this site and find our Chifa Aji, Green Tomato Aji, and Roasted Tomato Aji as well. These sauces are so delicious and versatile I don’t know if we eat a meal at home without them since returning from Peru. We encourage you to explore these recipes and hope that you will make your own and share your ideas with us!